Account administrators can perform administrative functions such as modifying site pages, adding events, and customizing the contact database. Administrator can log in and access the admin backend – an area reserved for site and account administration, and not seen by ordinary members or visitors to your site. Account administrators should not be confused with bundle administrators. You can designate any contact as an administrator, and grant them full or partial administrative privileges. 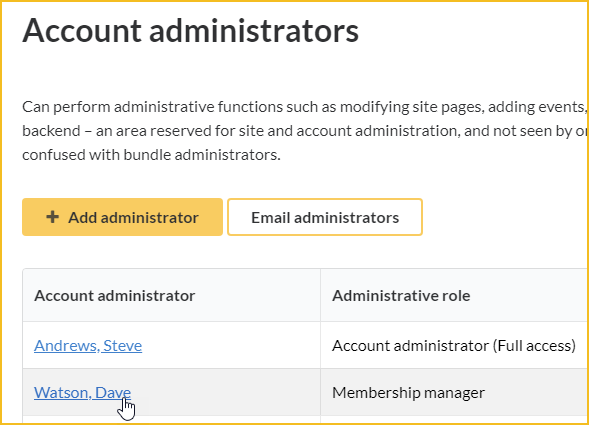 If you designate a member as an administrator, the member can switch back and forth between admin view and member view. If you designate a contact who is not a member as an administrator, the contact can switch back and forth between admin view and public view. For more information, see Switching views. Take care when granting full administrative privileges since full admins can delete other admins and even delete the entire account. A full admin can delete any other admin, including the one who created the account and/or pays for the account. A full admin can delete the account without the approval of the account creator. There are two ways you can manage your account administrators: one a time from individual contact records, or all together from a single screen where you can view, add, modify, remove, and email your account administrators. 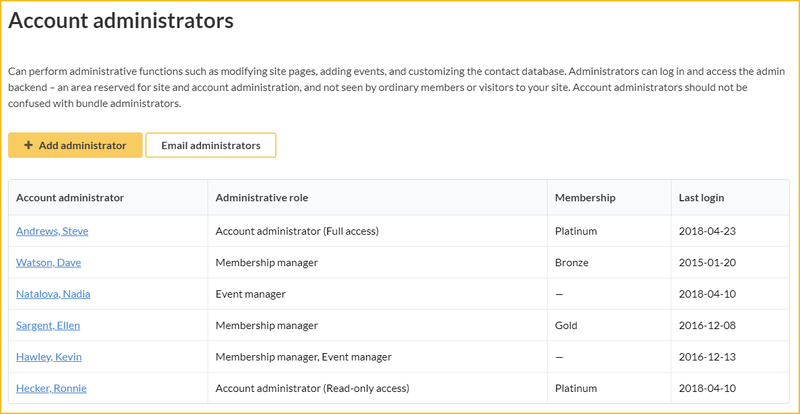 To manage all your administrators from a single screen, hover over the Account menu in the upper right corner of admin view and select the Manage account administrators option. For instructions on adding, viewing, modifying, removing, and emailing account administrators, see below. You can designate any contact in your database – whether a member or not – as an administrator. If you want to add someone as an administrator who is not in your contact database, simply add them as a non-member contact. Administrators can be granted full or partial administrative privileges. You can add as many administrators as you want, regardless of your billing plan. Only full account administrators can set administrator privileges for others. 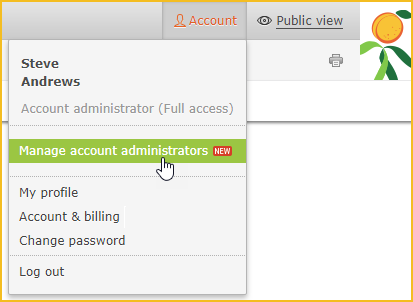 Hover over the Accounts menu in the upper right corner and select the Manage account administrators option. 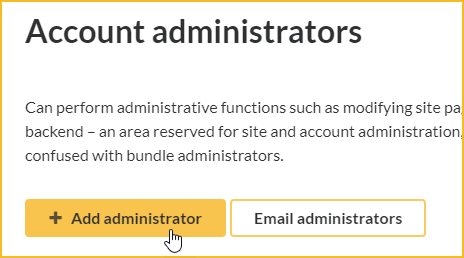 On the Account administrators screen that appears, click the Add administrator button. To add a new contact as administrator, enter the contact details in the fields provided. To designate an existing contact as an administrator, click the Select existing contact button and choose the contact. Within the Access role section, choose the access privileges to be granted to the contact. 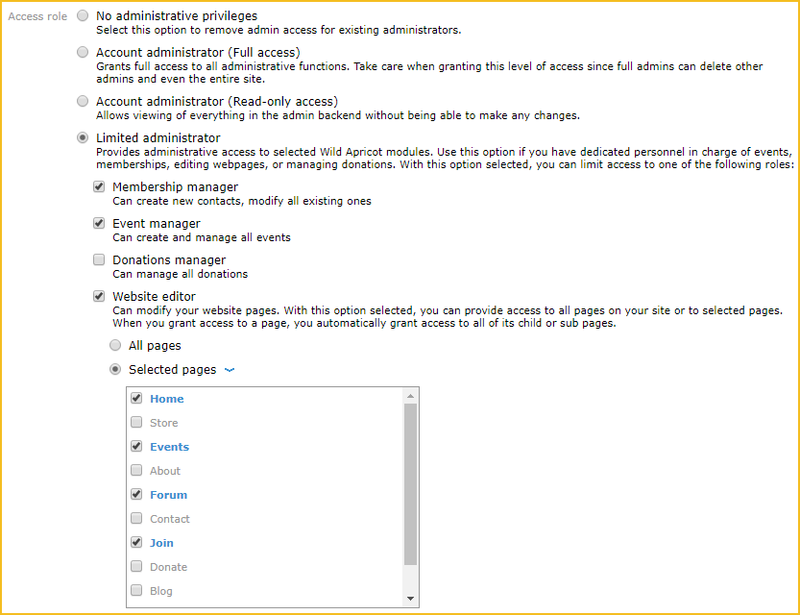 Select this option to remove admin access for existing administrators. Grants full access to all administrative functions. Take care when granting this level of access since full admins can delete other admins and even the entire site. Allows viewing of nearly everything in the admin backend without being able to make any changes. Website editor – can modify your website pages. With this option selected, you can provide access to all pages on your site or to selected pages. When you grant access to a page, you automatically grant access to all of its child or subpages. Website editors with access to selected pages will see all pages but can only edit the ones assigned to them. 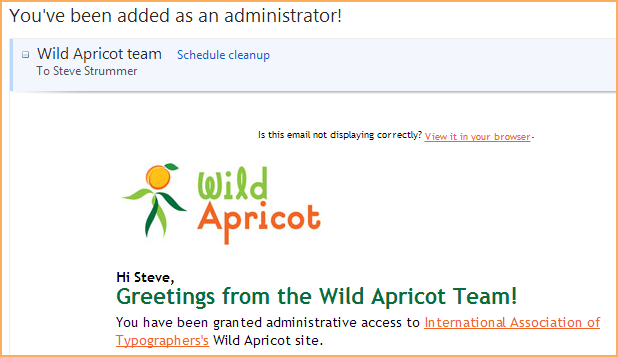 When a contact is granted administrator privileges, an email is sent to the contact with links to more information about managing Wild Apricot sites. You can also assign administrative privileges from a contact's Contact details tab. To do so, click the Edit button to the right of the Login details heading. From the Login settings screen, choose the access privileges to be granted to the contact then save your changes. There are two ways to view a list of currently assigned administrators. 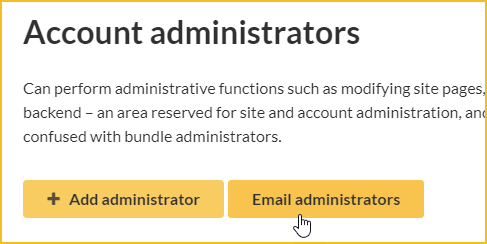 To view and manage your account administrators, hover over the Accounts menu in the upper right corner and select the Manage account administrators option. The Account Administrators screen will appear. From here, you can view, add, modify, remove, and email your account administrators. 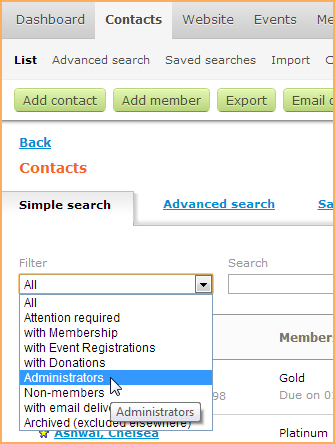 On the Simple search page, click the Filter drop-down list and select Administrators. Within any contact list, administrators have a star icon appearing beside their name. To narrow the list to display only certain types of administrators, you can enter the administrator type – e.g. 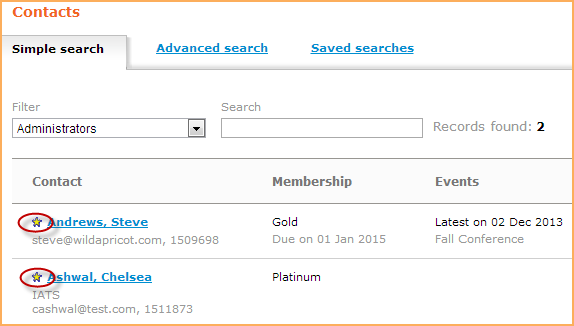 "membership manager" – in the Search field. There are two ways to change the administrative privileges for an existing account administrator. To change the administrative privileges for an existing administrator from the Account administrators screen, click the name of the administrator within the list. On the Access role screen that appears, select a different access role then click Save. To change administrative privileges from a contact's Contact details tab, click the Edit button to the right of the Login details heading. From the Login settings screen that appears, choose a different access role then click Save. An email will not be sent to the contact to inform them of the change. There are two ways to remove administrative privileges for an existing account administrator. To remove administrative privileges for an existing administrator from the Account administrators screen, click the name of the administrator within the list. On the Access role screen that appears, choose the No administrative privileges option then click Save. To remove administrative privileges from a contact's Contact details tab, click the Edit button to the right of the Login details heading. Within the Login settings screen that appears, choose the No administrative privileges option then click the Save button. On the Account administrators screen that appears, click the Email administrators button. Choose the email template you want to use as the basis for your message. For more information, see Email templates. Click the Design tab and finalize the content for your email blast. Click the Recipients tab and specify a subject for your message. Click the Review and send tab and send or schedule your email. For more information on sending email blasts, click here. The tables below indicate which types of administrators are allowed to view or modify restricted features. * Limited administrators can only delete files that they have added themselves.